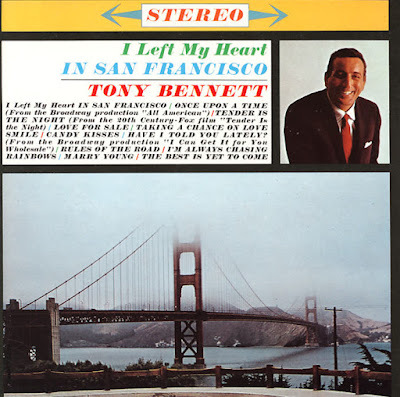 Tony Bennett's signature song, "I Left My Heart in San Francisco," marks its 50th anniversary from its original recording date on January 23, 1962. The song garnered Bennett his first Grammy award for "Record of the Year," and as a Grammy nominee this year for "Duets II," Tony holds the longest span of Grammy nominations in the music industry. Upon the release of "Tony Bennett: The Complete Collection," the most extensive collection of Tony's recordings to date, the New York Times commented, "We aren't likely to see a recording career like this again." On January 27, PBS' "Great Performances" will premiere "Tony Bennett: Duets II," a stunning visual presentation of the full performances from Bennett's #1 CD, "Duets II," featuring Tony recording with Lady Gaga, Carrie Underwood, Aretha Franklin, John Mayer, the late Amy Winehouse and a host of others. In 1961, Ralph Sharon, Tony's pianist and musical director at the time, took the sheet music for "I Left My Heart in San Francisco," a song written by George Cory and Douglass Cross, with him as he prepared to go on the road with Bennett, knowing that the singer was making his first performance in San Francisco. They rehearsed the song after a show at the Vapors Restaurant in Hot Springs, Arkansas (President Clinton would later confide to Tony that he was at his performance that evening, peeking through the club windows). Satisfied that they had a song with a local theme to add to the San Francisco engagement, Tony performed the song live at the Venetian Room in the Fairmont Hotel in San Francisco. The song went over so well that at Bennett's next recording date in New York, he added the song to the track listing and Columbia Records made it the "B" side of a record that all concerned felt was destined to be a hit, a lovely song called "Once Upon a Time," from the Broadway show "All-American." Recorded in NYC on January 23, 1962, Bennett recorded it in one take and the song was highlighted by a gorgeous orchestration by Marty Manning, who had worked on several Bennett hits and also scored Luiz Bonfa's "The New Face of Bonfá" album, produced for CD reissue by Arnaldo DeSouteiro in 2003. As Tony recalls, "I was convinced that 'Once Upon a Time' was going to be a smash and a few weeks after it came out the Columbia rep called me and said, 'Turn the record over, "San Francisco" is really catching on.'" From a grassroots hit, "I Left My Heart in San Francisco" made Bennett an international star and began his long-standing love affair with the city by the bay. The song, rarely covered by any other artist, has become an integral part of San Francisco's cultural landscape and is played after every Giants win in their stadium. Tony painted a heart for the city's "Hearts in San Francisco" project, which is on permanent display in Union Square. This Valentine's Day, February 14, Bennett will return to San Francisco's Venetian Room to perform his signature song and his many hits for a benefit event in support of the University of California, San Francisco's Division of Cardiology.